Blank DVDs and CDs are going the way of the dinosaurs in favor of the infinitely reusable and non-OS specific (usually) flash drive. These little devices allow sharing of data with the click of a USB port, and they’re much greener than one time use only discs if you’re into that sort of thing. For the longest time these little devices had all the style of a giant suppository, but that’s just not the case any longer. 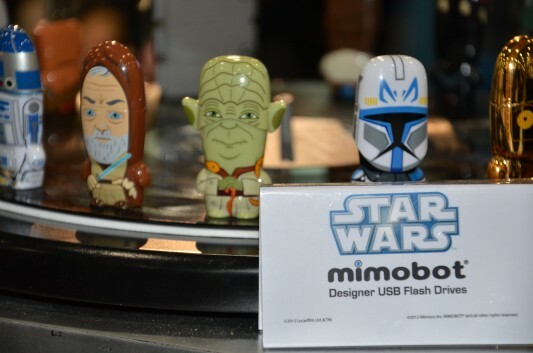 Mimobot is a company that’s creating USB flash drives and card readers that allow their owners to show off their geek love while still having a flash drive at the ready. The company had and still has the Star Wars license so last year there were R2D2, Yoda, and C3PO flash drives along with many other classic characters. This year they upped the ante with a Millennium Falcon card reader, as well as new flash drives from DC Comics and Transformers. My fingers always get so cold as I type away all day long. It’d be really nice if there was something you could easily use to warm up your fingers. Hopefully, such a device will be available real soon, as Japanese toy company Takara Tomy has come up with a USB hand warmer. 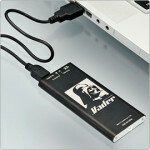 Just plug in the device to a USB port to charge it for 2 hours, and you’ll get around 4 hours of hand-warming goodness! Though the devices are not yet available for purchase and pricing has not yet been revealed, so far two Star Wars-themed devices — Darth Vader (in black); R2-D2 (in blue) — were created. There’s also a pink Hello Kitty version. See the pics here below.